Beautifully engraved specimen from the Brooklyn Union Gas Company dated in 1944. This historic document was printed by Hamilton Banknote Company and has an ornate border around it with a vignette of two allegorical men with company facilities in the background. This item is over 61 years old. 38 coupons attached on right. 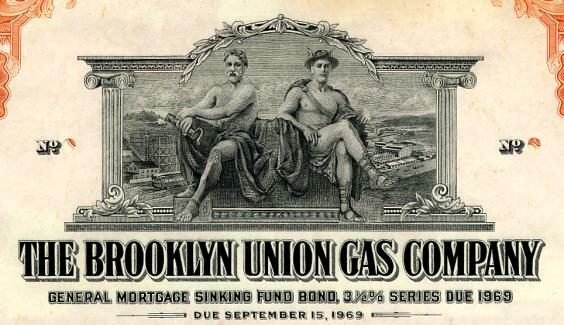 In 1997, after 102 years, Brooklyn Union Gas Company formed a holding company with a new name, KEYSPAN Energy Corporation. 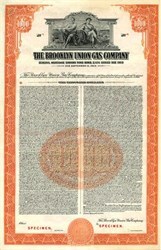 Each share of Brooklyn Union was exchanged for one share of KEYSPAN. KEYSPAN is the nation's fifth largest gas distribution company and has been a pioneer in the industry. Earnings for the first nine months of this fiscal year are up 11-percent over the same period last year due to gas sales growth, added revenue streams and cost efficiencies. It holds interest in various companies, including Houston Exploration, Iroquois Gas Transmission System and BG PLC's Phoenix Natural Gas Ltd. and Premier Transco Ltd. subsidiaries.